A close view of the kinds of bio-mats typical of the Del Puerto Canyon alkaline streams. People interested in Mars exploration, like many of the scientists at the Carl Sagan Center (CSC) in Mountain View California, often start by exploring cold, dry, thin aired Mars-like "analogue" sites on earth. Most of these places are isolated and hard to reach. Antarctica, the Arctic, the Peruvian Andes, Kamchatka and other exotic locales offer scientists glimpses into the kinds of environments that may hold clues to understanding Mars and the processes that have shaped it. Of key interest is the extreme or unusual conditions under which life persists. We know that everywhere on earth where we find liquid water, we find life, but what are the limits? How cold, how hot, how high, how deep, can life be and still survive? Temperature, pressure, gravity, pH, salinity, radiation, available nutrients and more all represent parameters that can influence an environment and its ability to sustain life, so areas where these parameters are extreme can be very informative. One adventurous CSC planetary geologist has found a spot with intriguing potential right here in Northern California. Her name is Dr. Jen Blank and she studies the rocks and streams of Del Puerto Canyon, not far from San Jose, for clues to life on Mars. A savvy geologist learns much just from looking at a rock. Quickly revealed is much about how the rock was formed, whether at great pressure deep within the earth or by sedimentary processes in an ancient ocean, for example. In the case of Del Puerto Canyon, the area was once ocean crust that has been heaved up on to the continent after experiencing great tension and pressure. Such areas, referred to by geologist as "ophiolites" are relatively rare on earth and are characterized by high concentrations of magnesium and iron. In the rest of the solar system however these "mafic" (ma for magnesium and "fic" for iron) rocks are believed to be typical of rock types that have reacted with water. The rocks in Del Puerto Canyon tend to be twisted, broken and reformed, held together by "cements", the fine-grained minerals which bind the coarser-grained matrix in some of the area's most interesting rocks. The tectonic forces that pushed these rocks to the surface have stressed, squeezed and shattered the rocks, leaving them altered chemically, and twisted, broken, and reformed. During these transformations, hot water percolated through the fractures, transporting and depositing fine-grained minerals to form an interconnected lattice of white-colored veins. In addition, cool waters are continually leaking from the rocks. The waters are believed to be a mixture of the rock-derived fluids and rain water that has penetrated down through the cracks. The water drains to the low areas, forming intermittent creeks and streams that disappear during the hottest summer months. The stream bottoms are lined with a primitive pavement of cemented carbonate material formed around pebbles and cobbles. Put all this together and it becomes a very interesting Mars analogue site. Del Puerto Canyon's low flowing, seeping springs and streams are particularly interesting to a Mars analogue scientist. First, they are alkaline, rather than the usual neutral or even acidic pH found in the hotsprings and iron rich rivers that are typically studied by Mars scientists. These seeping springs are host to a rich microbial ecosystem of free-floating bacteria, biofilms, and microbial mats. Microbial mats are often studied but are more common in warm, salty water, where they reach thicknesses of more than a meter and form masses called stromatolites, likely candidates for earth's oldest life forms. When bacteria form into layers, different chemistries result, ranging from photosynthesizing bacteria on the surface layers to anaerobic sulfur dependent layers buried where no sunlight reaches. The Del Puerto biofilms are less than a millimeter thick and appear in a range of colors from bright yellow and red to dark brown. They appear on rock surfaces above and below the stream's water level. 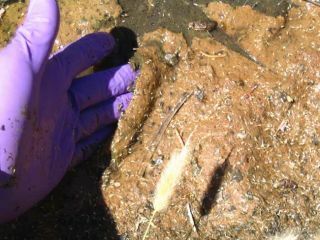 The microbial mats are thin, only a few millimeters thick, with a distinct structure, leathery to the touch, and those associated with the streams borders appear to be growing in direct contact with the cements. While typical warm salt water stromatolite colonies appear to be fueled by solar radiation, Dr. Blank believes that the leathery Del Puerto canyon mats may be fueled by the mineral energy derived from the slow drain of the springs over the surrounding mineralogy and represent an extreme that pushes our understanding of the limits of life. Many scientists distrust coincidences and Dr. Blank is no exception. Her chosen area of study has an intriguing geology with unusual mineralogy and chemistry. In conjunction with this is a fairly unique biological ecosystem. Could this be a coincidence or is it more likely cause and effect? Where we find fresh water microbial mats growing in conjunction with mineral cements of a given chemistry, perhaps they influence or even shape one another. Could the cements of Del Puerto Canyon represent a biomarker? Find those distinctive cements in Mars rocks and maybe, just maybe, there was once life nearby.